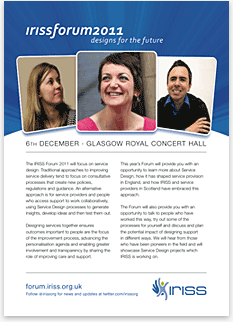 The IRISS Forum 2011 will take place on December 6th at Glasgow Royal Concert Hall and will focus on service design. Traditional approaches to improving service delivery tend to focus on consultative processes that create new policies, regulations and guidance. An alternative approach is for service providers and people who access support to work collaboratively, using Service Design processes to generate insights, develop ideas and then test them out. Designing services together ensures outcomes important to people are the focus of the improvement process, advancing the personalisation agenda and enabling greater involvement and transparency by sharing the role of improving care and support. This year's Forum will provide you with an opportunity to learn more about Service Design, how it has shaped service provision in England, and how IRISS and service providers in Scotland have embraced this approach. The Forum will also provide you with an opportunity to talk to people who have worked this way, try out some of the processes for yourself and discuss and plan the potential impact of designing support in different ways. We will hear from those who have been pioneers in the field and will showcase Service Design projects which IRISS is working on. The event is targeted particularly at those able to make change happen: commissioners, heads of service, Change Fund leads, and those participating in planning groups. © 2010–2015 Institute for Research and Innovation in Social Services. All rights reserved.